At IGFA the students did a lab which included learning about the different fish and the different habitats. They also learn about the evolutionary changes that fishes go through. Then they take a tour of their wetlands which has alligators, birds, fish and many other animals. Students learn about astronomy through various programs offered at the BCC Beuhler Planetarium. They learn how early people used the stars to navigate the seas. Gumbo Limbo is located in Boca Raton, Florida at Red Reef Park on the barrier island between the Atlantic Ocean and the Intracoastal Waterway. Twenty acres of Boca Raton's Red Reef park have been reserved specifically for a nature center and the preservation of a natural plant association known as a tropical hammock. The marine and estuarine location, and the diversity of native vegetation communities found within Red Reef park, also include the coastal dune, a sabal palm hammock and a mangrove wetlands. Interesting faunal species include a variety of mammals, birds, reptiles and fish. Rare and endangered species such as the manatee, the brown pelican, the osprey and sea turtles can often be observed on or from the facility. Coastal relics like a shell midden from the Pre-Columbian Indians and Pond Apple trees from the original freshwater body (known as the Spanish River) can be seen. A cannon and anchors have also been found on the shore of Red Reef park. All these assets give Gumbo Limbo a unique blend of living history. The 3 day field trip for the freshmen takes place on a deserted island that they must travel to by kayak. Students learn about marine ecosystems through team building activities. 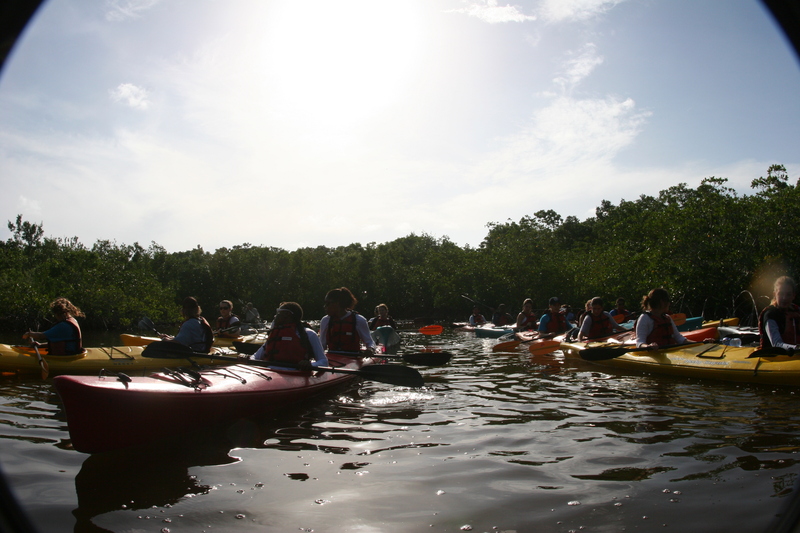 The students kayak in teams of two to various habitats where they observe the interdependence of the different inhabitants of the ecosystems.